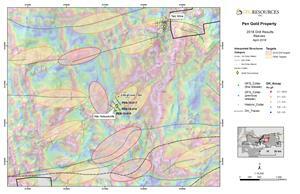 GFG Discovers New Gold Zone with 21.26 g/t Gold over 1.7 Metres at Pen Gold Project West of Timmins, ON - GFG Resources Inc. The 4,000 m Phase 1 2019 drill program at the Pen Gold Project is on-going with two drill rigs testing high priority targets in the Reeves, Slate Rock, Jehann and Deerfoot regions. SASKATOON, Saskatchewan, April 03, 2019 (GLOBE NEWSWIRE) -- GFG Resources Inc. (TSX-V: GFG) (OTCQB: GFGSF) (“GFG” or the “Company”) is pleased to announce assay results for the remaining 12 drill holes and the discovery of a new gold zone (See Table 1) from its inaugural 2018 drill program at its 100% owned Pen Gold Project located 40 kilometres west of the prolific Timmins Gold District in Ontario, Canada. The new gold discovery was made at the Crawford target from hole PEN-18-016 which intersected 21.26 g/t Au over 1.7 m at 100 m depth. 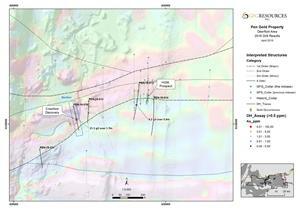 The new mineralized zone is located 500 m west of the HGM occurrence in the Deerfoot regional target (See Figures 3 and 4). The 2018 drill program consisted of 19 drill holes (4,744 m) ranging in depth from 150 to 500 m (See Table 1 and link to news release dated January 17, 2019, “GFG Drills 33.77 g/t Gold over 1.05 Metres at Pen Gold Project West of Timmins, ON”). The program was designed to test six targets distributed across a 20-kilometre segment in the eastern portion of the Pen Gold Project (See Figures 1-5). These targets were generated from the integration of historic and new data sets from the Company’s 2018 exploration program. Based on these results, follow-up drilling is warranted on the Crawford, Nib-Yellowknife and Sewell targets. PEN-18-013 targeted the westward extension of the HGM occurrence within the central portion of the Deerfoot region where historic drilling returned 43.00 g/t Au over 1.5 m. The step-out hole returned 9.20 g/t Au over 0.9 m in altered, deformed and sulphidized mafic volcanics at a depth of 80 m below surface (See Figure 4). 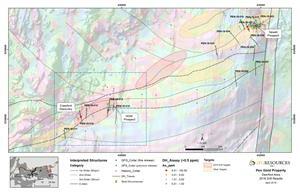 This intercept confirms that the mineralized zone at HGM is open to the west at shallow depths. Re-logging of drill core from several historic holes is underway to provide a better understanding of the controls on gold mineralization at this prospect and to guide future drilling in the area. PEN-18-016 targeted the continuation of the same deformation zone as PEN-18-013, 500 m to the west of the HGM prospect, where interpretation of IP resistivity and airborne magnetic data suggested increased lithologic and structural complexity. At 138.4 m down the hole, a zone of intense deformation and silica-sericite alteration was intersected on the contact between felsic porphyry and mafic volcanic stratigraphy (See Figures 3 and 4). This quartz-veined and sulphide-rich interval contained visible gold and returned 21.26 g/t Au over 1.7 m including 39.70 g/t Au over 0.9 m(Click here to view core photo). In addition to gold mineralization, this interval was elevated in silver, bismuth, tellurium and zinc. A second zone of gold mineralization returned 1.20 g/t Au over 1.2 m from 143.0 m downhole. These intercepts mark a new discovery (Crawford) along a prospective segment of the PDFZ where limited historic drilling has been conducted. The Company plans to follow-up on this discovery with additional drilling in 2019. The mineralized intercepts from Crawford and HGM are approximately two kilometres southwest of the Sewell prospect where the Company recently intersected high-grade gold mineralization of 33.77 g/t Au over 1.1 m, including 63.88 g/t Au over 0.6 m and 3.57 g/t Au over 5.6 m, including 7.44 g/t Au over 1.9 m; 4.20 g/t Au over 1.0 m and 14.70 g/t Au over 0.8 m. Within this gap between these targets there has been a limited amount of historic exploration due to extensive till cover. Through modern exploration techniques the Company believes this area to be highly prospective for gold mineralization and has outlined several priority targets to test in the Phase 2 2019 program (See Figure 2). PEN-18-017 targeted the northeastern extension of shear veins exposed at the Nib-Yellowknife target within the Reeves region where historic grab samples returned up to 37.60 g/t Au in altered and quartz-veined diorite. Three distinct zones of alteration and deformation were encountered; two of which contained visible gold in quartz veins cutting carbonate-altered diorite. 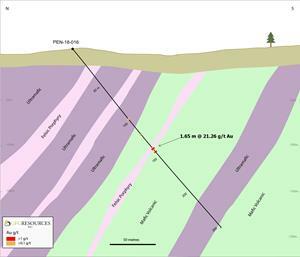 The lowermost zone, intersected from 250 m down the hole, contained up to 15% arsenopyrite and pyrrhotite and 20% quartz vein material, returned 0.89 g/t Au over 7.0 m (See Figure 6). In addition to gold, this interval was elevated in tungsten. 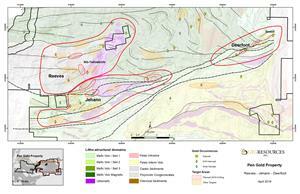 While only low-grade gold mineralization was intersected, the occurrence of visible gold confirms the prospectivity of this deformation zone along the western margin of the Reeves ultramafic complex and follow-up drilling will be completed in this area. The Company is progressing well with its 4,000 m Phase 1 drill program with two drill rigs focused on highly prospective targets in the Reeves, Slate Rock, Deerfoot and Jehann regions (See link to news release dated February 27, 2019, “GFG Begins Drilling and Outlines 2019 Exploration Program at its Pen Gold Project West of Timmins, Ontario”). The Phase 1 drill program is anticipated to be completed in April with assay results expected to be announced in Q2 2019. Over the next six months, the Company will conduct additional regional till sampling, ground geophysics, prospecting and mapping on its 475-square-kilometre Pen Gold Project. The Phase 2 2019 drill program of approximately 4,000 m is planned to begin in the second half of 2019. At the Rattlesnake Hills Gold Project in Wyoming, U.S., the Company is working with its JV partner, Newcrest Mining Ltd., on re-modeling the district and deposit-scale geological and geophysical data, to drive both deep and greenfield drill targeting. As part of this process, the Company is currently applying Corescan technology to historic deep drill holes and innovative machine-learning technology to constrain geochemical and mineralogical vectors related to gold mineralization to further refine deep drill targets. The Company plans to provide a detailed summary of the 2019 exploration activities in Q2 with an aggressive drill program anticipated to begin in early Q3 2019. Surface grab and drill core samples are being analyzed by Bureau Veritas Commodities Canada Ltd. Preparation of a 1-kilogram pulp and gold assay of a 50-gram aliquot by Pb collection fire assay with an Atomic Absorption Spectrometry finish (Package FA450) are being done in Timmins, Ontario. Samples assaying above 5 ppm Au are being routinely re-run using gravimetric finish (Package FA550). Mineralized zones containing visible gold will also be analyzed by screen metallic fire assay. Multi-element analysis for 59 other elements using a four-acid digestion and an ICP-MS finish (Package MA250) is being done in Vancouver, British Columbia. Quality control and assurance measures include the monitoring of results for inserted certified reference materials, coarse blanks and preparation duplicates of drill core.